or rather the lack of it. As they do not have natural predators, you can get very close to them without affecting their behavior. In my last post, I went into how to travel the Galapagos Islands. I pointed out that a cruise is the best choice if you want to travel comfortably and wish to see as many different places as possible. Furthermore, I stressed the fact that the likelihood of a quieter trip is greater on a large ship – but we speak only of 100 passengers here! Finally, I described the Silver Galapagos’ benefits in terms of luxury. 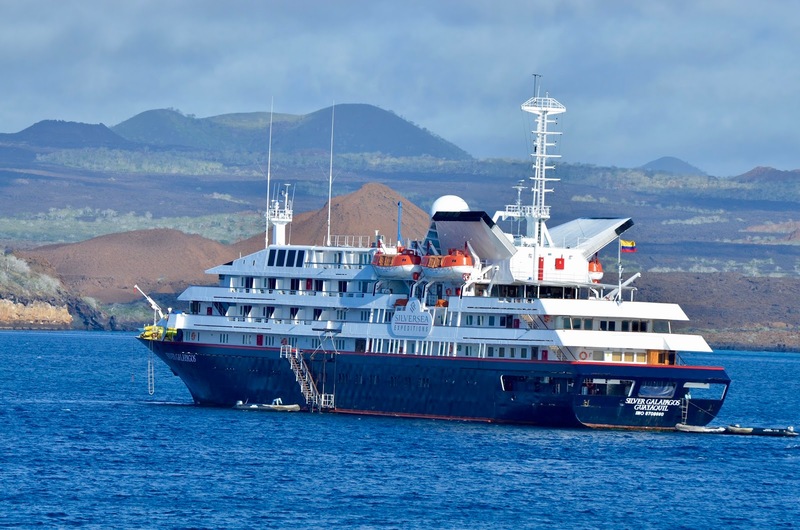 There is no better way to travel the Galapagos Islands on a luxury trip than aboard this ship. 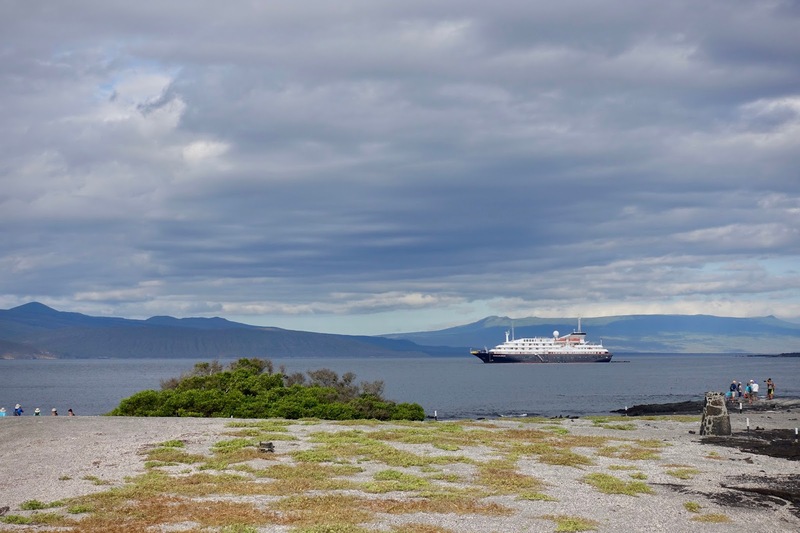 Silversea Expeditions, the adventure division of Silversea Cruises, operates two Galapagos Islands itineraries, out of which we did the western one (details see here). 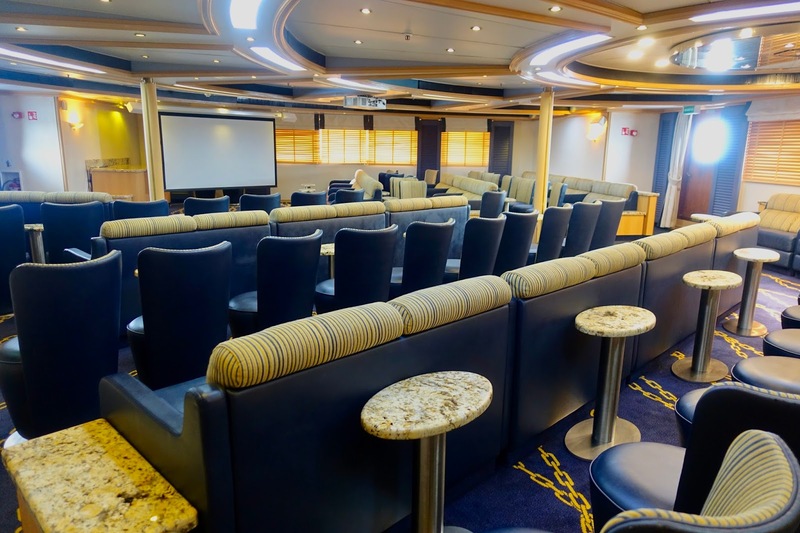 To illustrate how life is on the Silver Galapagos, I will narrate my typical day aboard this comfortable cruise liner. 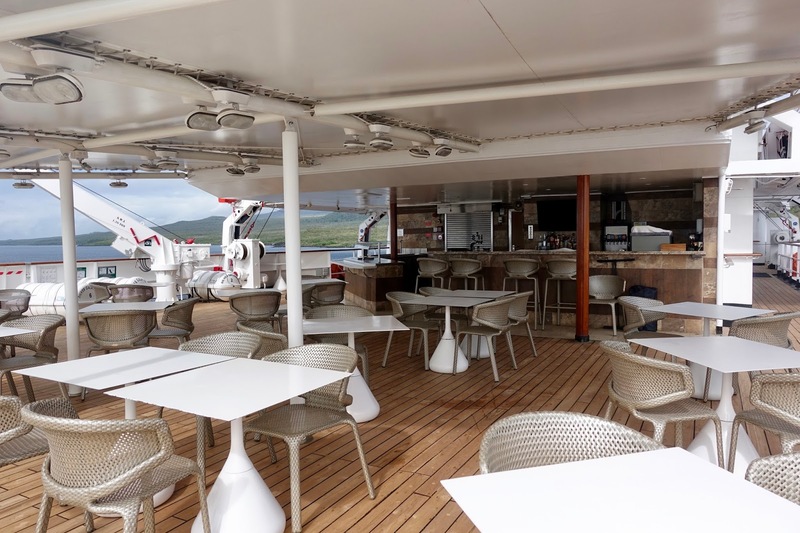 The most important thing you have to know about the Silver Galapagos is that it is an expedition ship, although a luxury one. 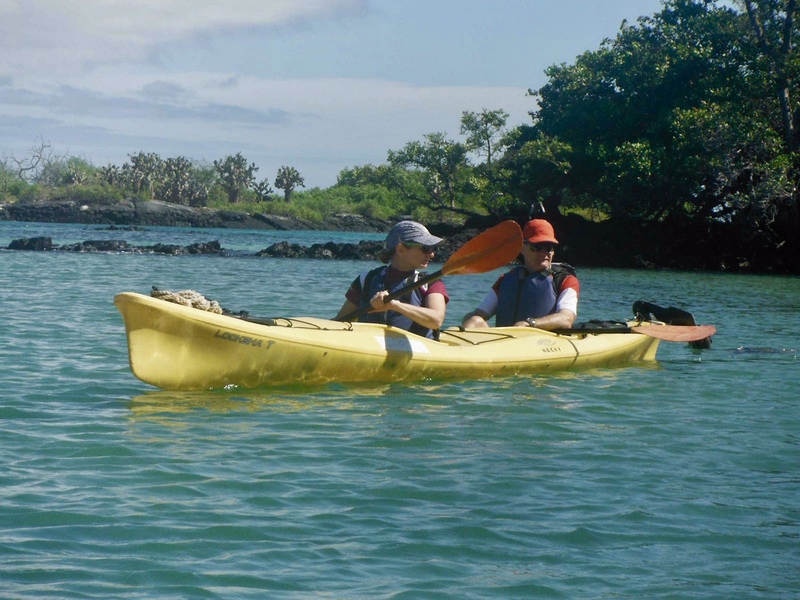 Cruising the Galapagos Island is supposed to be an adventure trip, however neither strenuous nor arduous, at least for a moderately fit person. 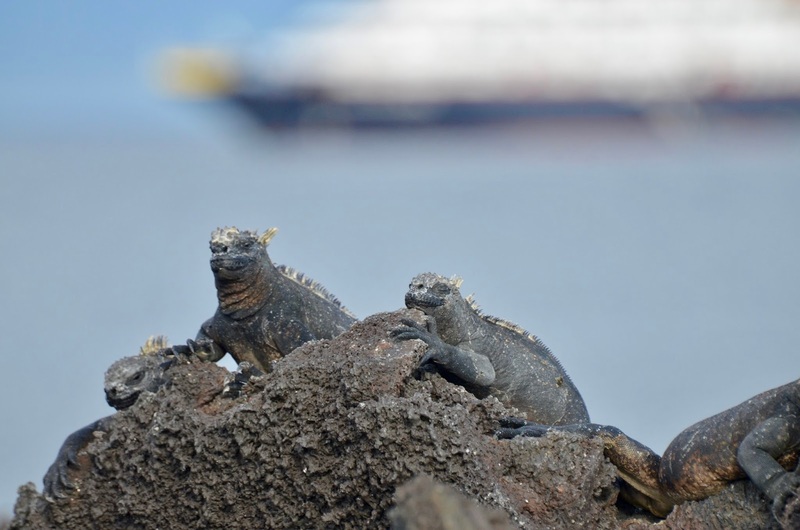 This means Silver Galapagos is not your traditional luxury fleet. 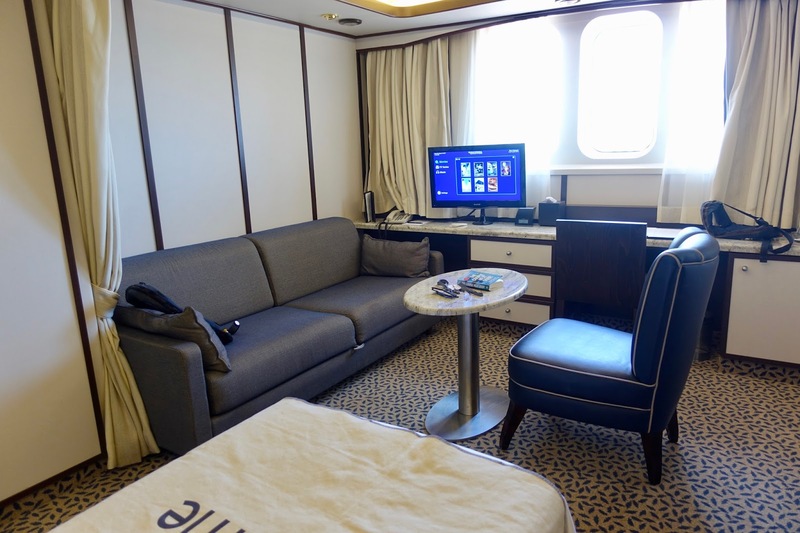 If you are a regular aboard “normal” Silversea ships, you might find the standard here a bit disappointing. You will find neither all the luxury touches as e.g. your favorite Champagne nor the super professional staff. 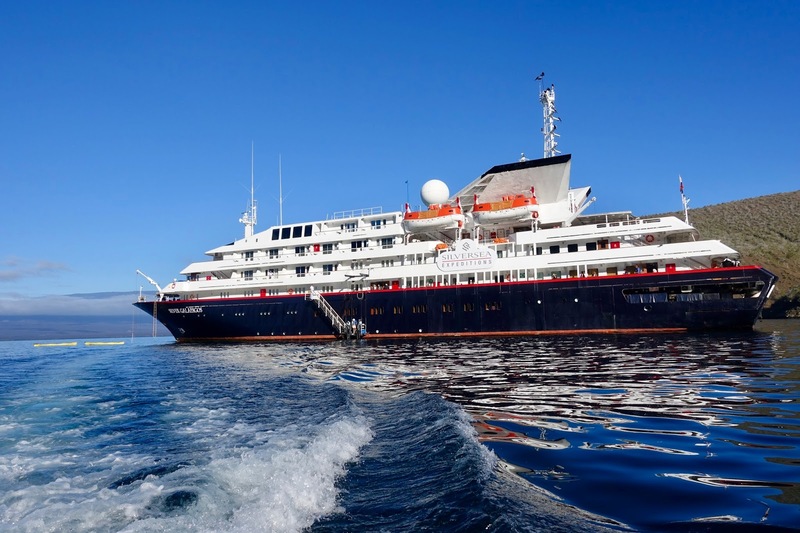 Silversea is a member of the International Galapagos Tour Operators Association and has therefore to adhere to strict regulations to protect the vulnerable environment. This involves locally sourced food and drinks, local bath amenities, an Ecuadoran crew and many other things. Nonetheless, there are enough luxury touches left to please also demanding travelers. But now to the typical daily routine aboard the Silver Galapagos. 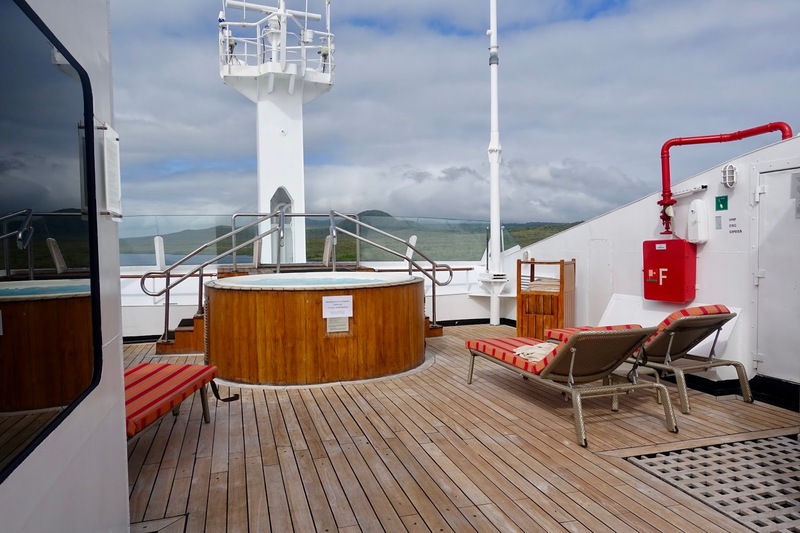 When I wake up in the morning in the Terrace Suite on deck 5 that I share with my husband, it is early but not that much so as most activities take place at a convenient time. I did have a good night’s rest as the sea was not rough – it rarely is at this time in the year – and the luxury linen felt so good. I let my gaze around the suite. Actually, we had wanted a Veranda Suite but they were all gone when we booked about half a year before. But we are very satisfied with our splendid accommodation. It is rather spacious (26.38 m2), it has large picture windows and provides an easy access to a public observation deck, there are a sitting area, a marbled bathroom with a large shower and a roomy wardrobe. I feel very comfortable in here, it is not at all cramped, except for the bathroom (only one person can be there at a time). After a hearty breakfast, a comprehensive buffet with a station where egg dishes are prepared on demand, served daily from 6:30 to 8:30, we proceed to the explorer room at 07:30 to go on the first excursion of the day, a hiking adventure. We are ushered into the provided zodiacs – usually an easy affair except when there is rough sea – and after a ten minutes’ ride we have a dry landing (no wet feet) on the island. 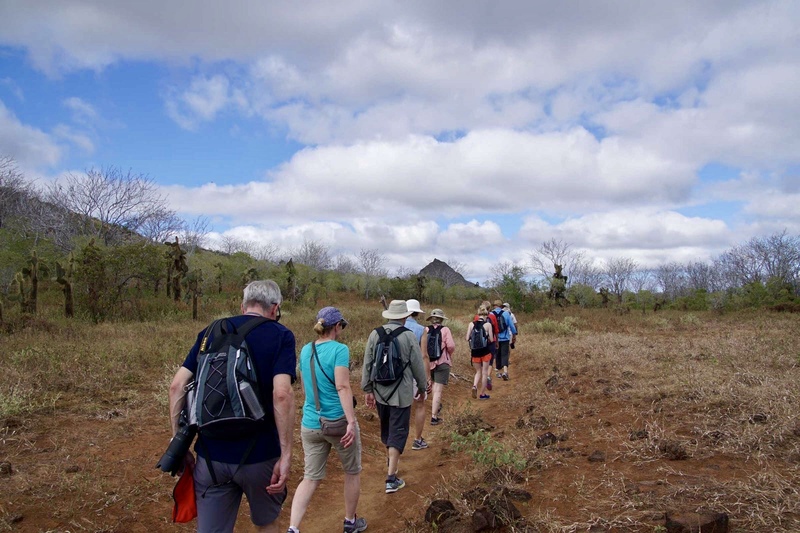 Our group of about 8 – 12 persons is accompanied by an experienced naturalist who points out all the important things to us. About two hours later, we are back aboard and are treated to cold drinks and wet towels. 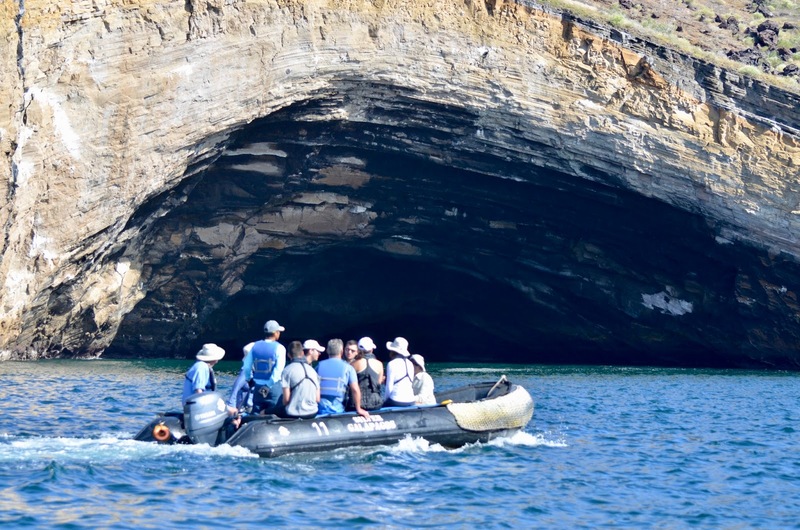 Alternatively to the hiking adventure, labelled as strenuous (it is easy for a moderately fit person), I could have gone on a zodiac tour along the coast with an activity level of low (sign up necessary). At 10:15 there is time for the next adventure, beach time and snorkeling. Meeting point is again at the explorer room with the snorkel gear and wetsuit provided by Silversea. This time, it is a wet landing meaning you get wet feet! If you need assistance with snorkeling, the staff is pleased to help you with this. My husband and I can manage without it although I am far from being an experienced snorkeler. At 12:00 everyone is back aboard. 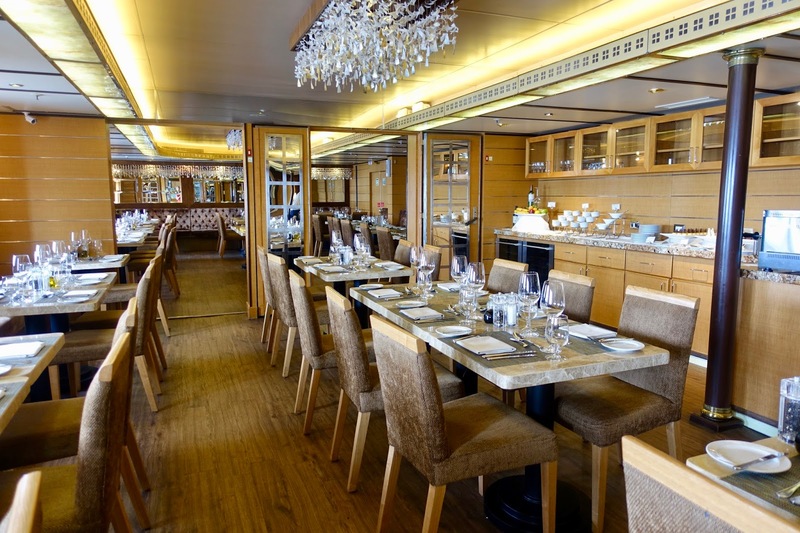 For lunch, you can either choose the grill on deck 5 or the restaurant on deck 2. You have to be early for the former as the space is limited and the place is quite busy at most times. On the contrary, the restaurant is a location where you can lunch in all tranquility. We prefer lunch in the grill as we like the outdoor seating and fortunately we have two acquaintances who always reserve two seats for us at their table, which we highly appreciate! The menu here is the same as in the restaurant: salads from the buffet (served), meat or fish/seafood from the grill, alternatively a pasta dish, and desserts from the buffet (self service). 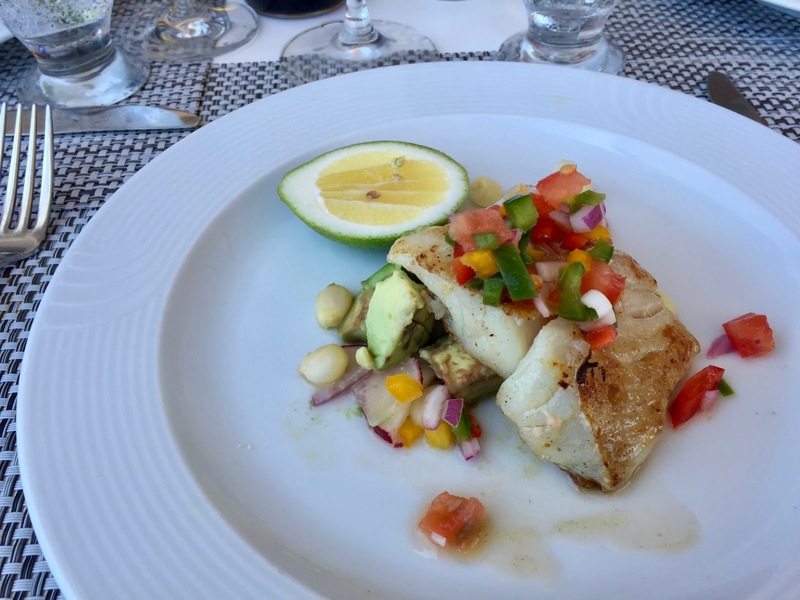 I always opt for the fish, it is constantly fresh and tasty. Today, there is delicious local fish on offer. Also I have a glass of white wine, nearly everything onboard is included in the cost of the cruise, also all the alcoholic drinks. One comment to the sparkling wine: although I am usually a fan of it, I did not like the one onboard, which comes from Chile, you remember, all the food and drinks have to be locally sourced. But as far as the quality of wine in general is concerned, there are no complaints here. At 13:45 there is a lecture by a naturalist. Although being well made and interesting, I skip it because I dozed off the last two times and I take a nap at the public observation deck in front of our suite instead. At 15:30 it is time for a kayaking session (with previous sign up), a little bit of workout is a fine thing to do after lunch and interesting things can be seen while doing this. We meet playful young sea lions, which are interested in our canoe. 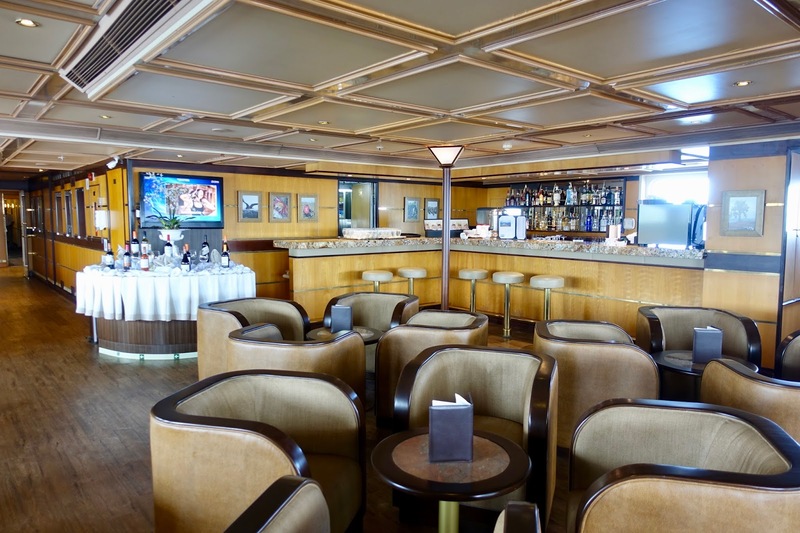 or we could have attended tea time at the piano bar to the sounds of the ship’s pianist Alfredo. At 16:30 a one-hour zodiac tour along the coast is scheduled. This is again a good occasion to spot animals and to enjoy the beautiful landscapes. At 18:00 everyone is back aboard. With a glass of white wine we make our way to the daily briefing and recap in the explorer room. Our brilliant expedition leader, Israel Mata, and his expedition team report on the activities of the day behind us and the one to follow. I like listening to his speeches, he does this in such a good way. After the orientation we go straight to dinner, which is always a highlight. It can be taken either in the restaurant or in the grill. You can start dinner at any time between 19:30 and 21:00 and either on you own or together with other guests, just as you wish. There is also the possibility to have in-suite dining, just in case. The dress code in the restaurants is casual, although shorts and jeans are not desired. 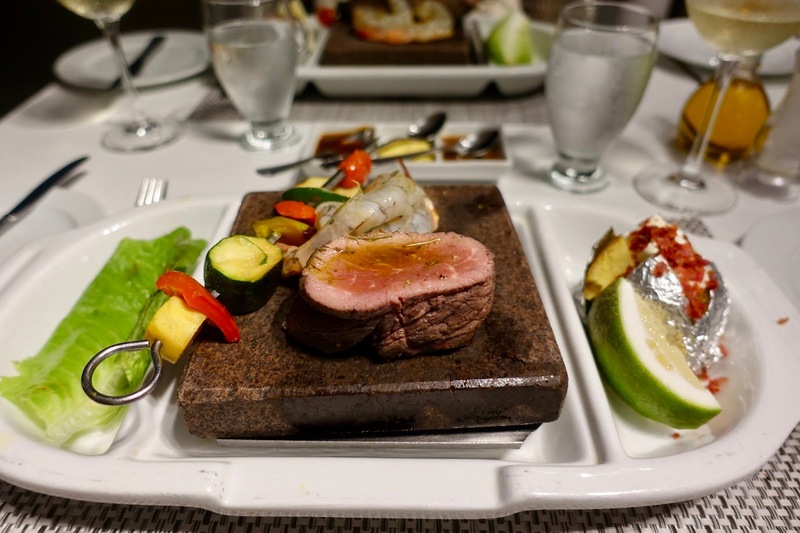 and a fabulous surf and turf dish, Lobster and Centre-cut Filet Mignon afterwards, which is accompanied by vegetables, a side salad and a baked potato. As to sauces you can choose between natural jus, peppercorn sauce, mushroom sauce or spicy Ecuadorian sauce. 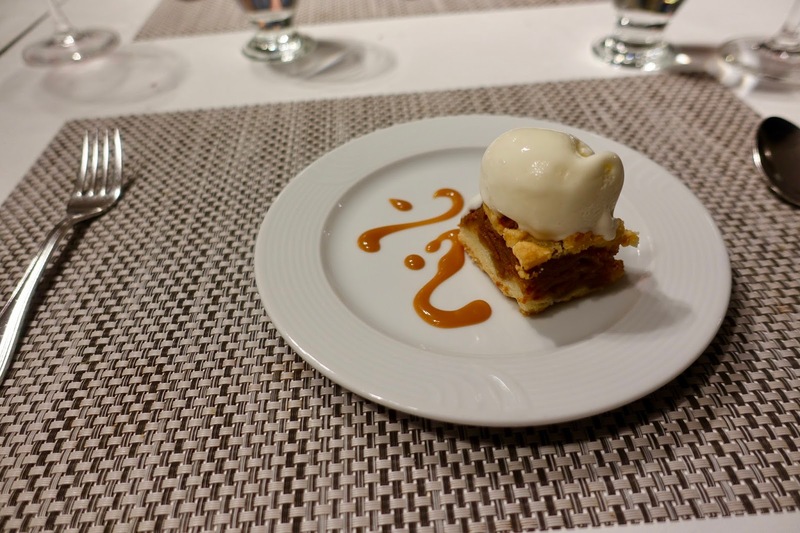 For dessert, I go for a delicious Apple Pie with vanilla ice cream and caramel sauce. 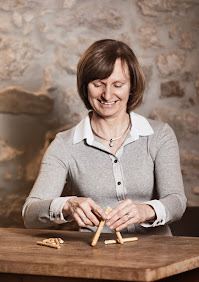 where you just show up and where the staff finds a suitable table for you without problem. The menu here changes daily, here is a sample menu to give you an impression. 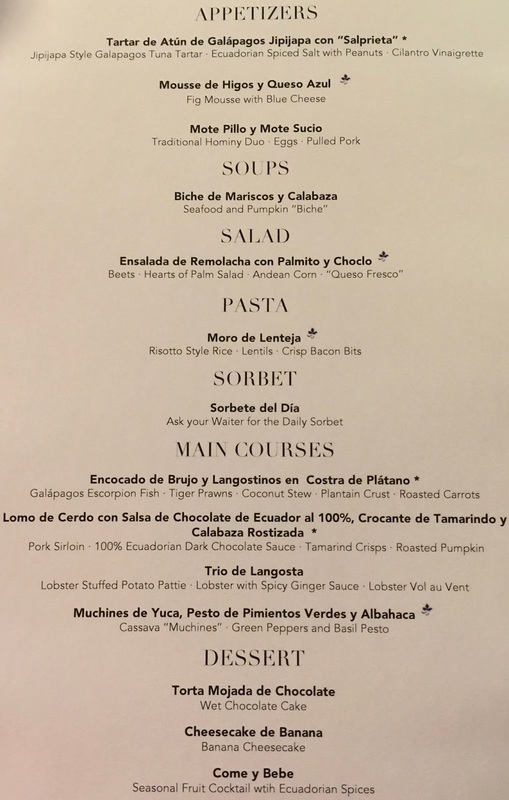 I usually have three courses from the extensive menu, but you could easily order four or more of them. As the size of the portions is quite generous and the desserts are not exactly light, I do not seek for more. 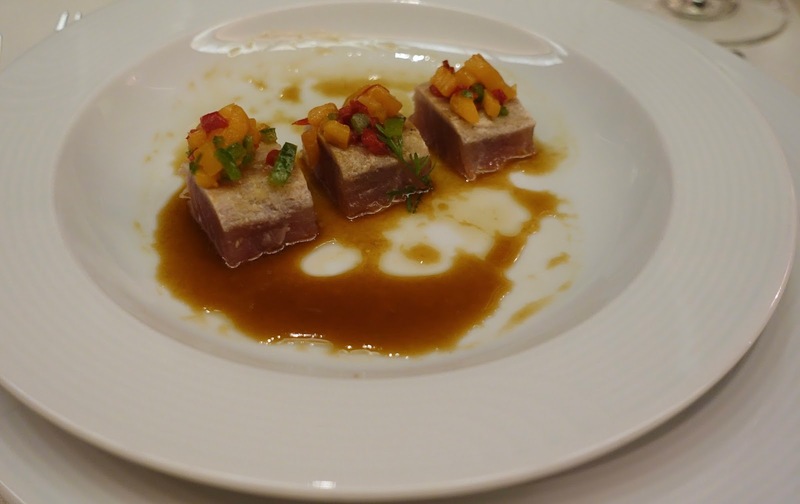 Menus emphasize local seafood, but cuts of beef and other meat dishes are featured as well. The chef also knows how to do Italian dishes very well! 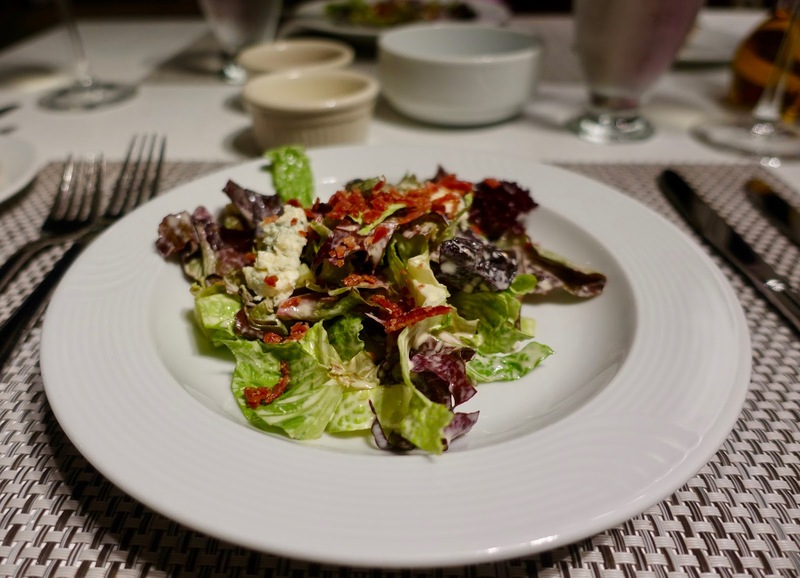 The cuisine is elaborate, the food quality is great, the dishes are skillfully prepared and nicely arranged and the staff does its best to please you. 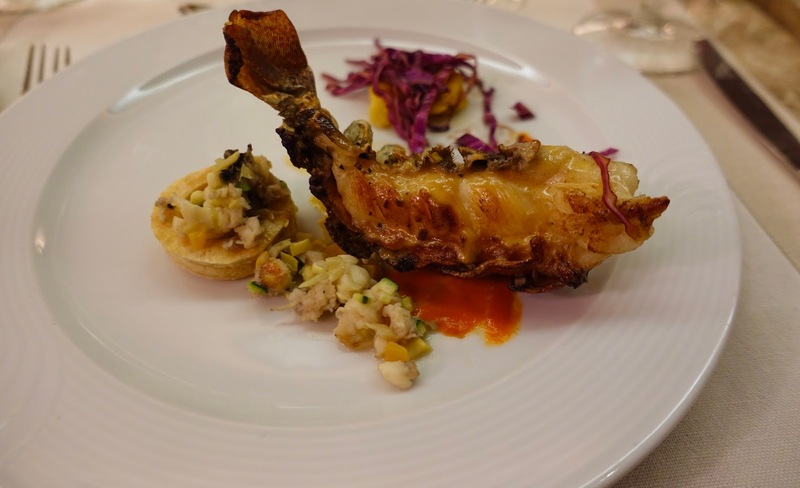 It is fair to say that also foodies will find what they are looking for, although you will probably not have your ultimate gourmet meal here – understandable in light of all the restrictions placed on Silversea by the Ecuadorian government. Once the meal comes to an end, there is of course the option of having after dinner cocktails and late night piano with Alfredo, but tonight Israel, the expedition leader, announces a special event, about a dozen Galapagos sharks are accompanying the ship. This of course entices almost all the 82 guests on board to flock on the deck to watch this fascinating spectacle. To end the report on this fantastic cruise some remark to my fellow guests. Quite a few of them are first-timers on a cruise, just like me. Given the fact that this is not your traditional cruise but an adventure voyage, you find here many people who does not consider themselves as cruisers but think this is the best way to explore the area. Guests are also generally younger than on the typical cruise liner. I would guess that the starting age of the passengers is in the 40s and 50s. There are also a handful of families, some with smaller, other with adult kids. 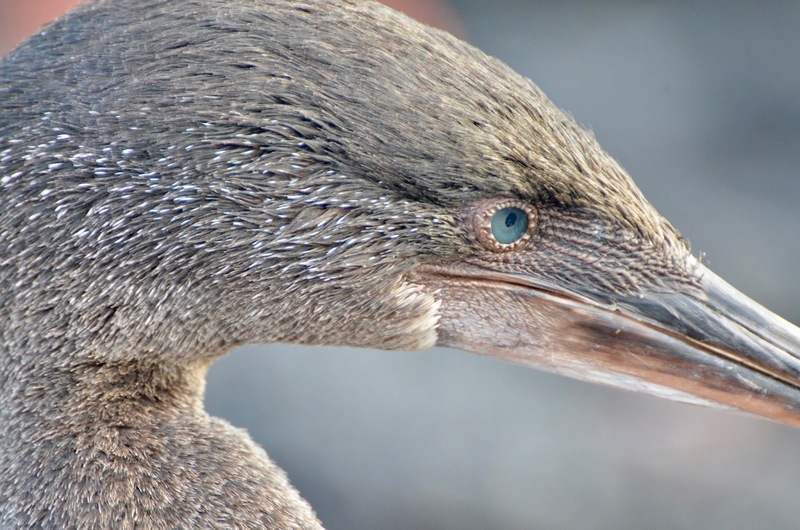 This once-in-a-lifetime destination is best explored by ship, ideally with a large one and if you would like to be pampered and if you are ready to spend money correspondingly, than there is no better choice than the Silver Galapagos. 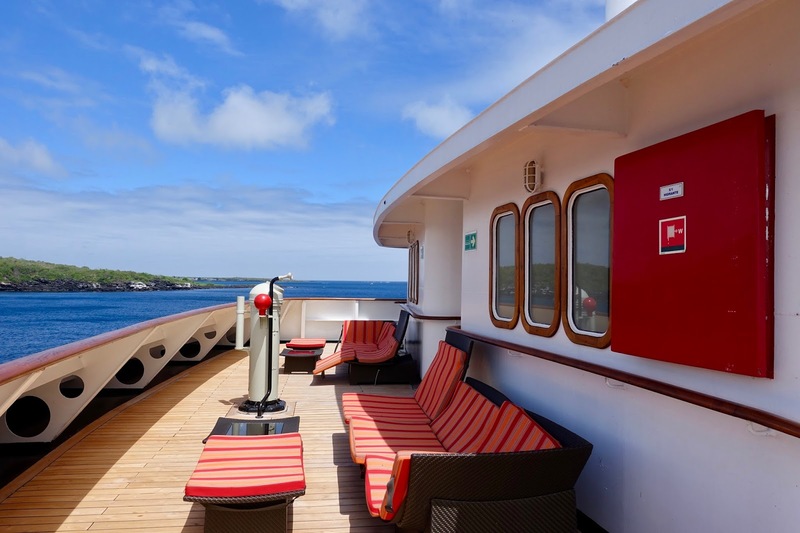 It is by no doubt the most luxurious way to travel the Galapagos Islands. 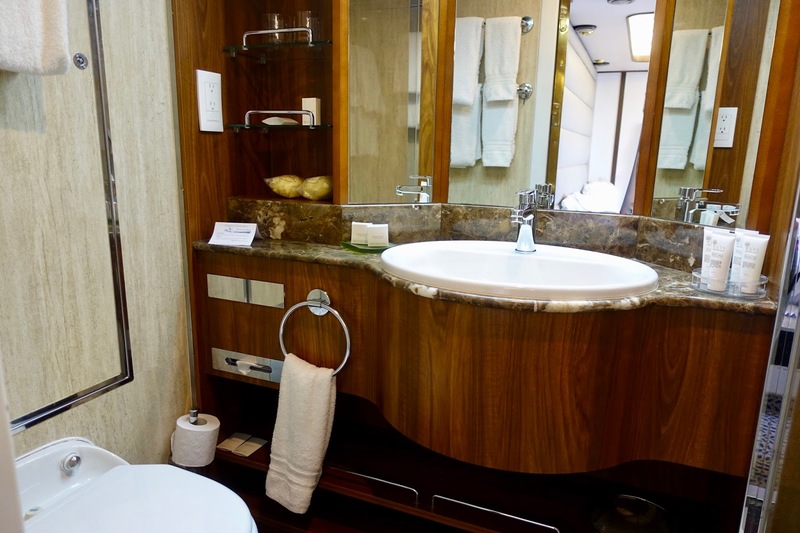 People who are used to traditional high-end cruise liners might find the level of luxury sub-par. The standard here is not the same, but you have to be aware of the fact that you are on an expedition ship, however a luxury one. But also as discerning traveler you will be at ease, all the necessary luxury touches are provided for and everything is perfectly organized. It is the ultimate setting for this trip of a lifetime allowing you to fully enjoy the magic that happens before your eyes. A note at the end: Not only the Galapagos Islands are worth traveling to, but also Ecuador's mainland. 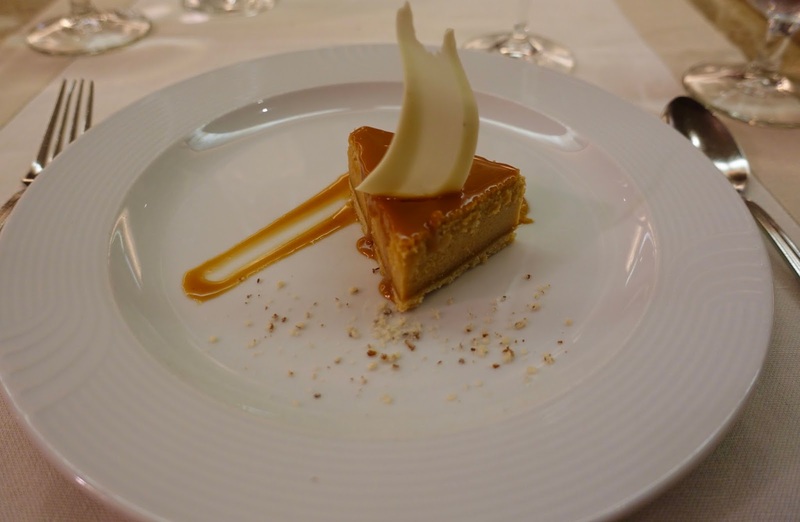 See my posts about what to do, where to stay on a luxury trip and where to eat as a foodie.